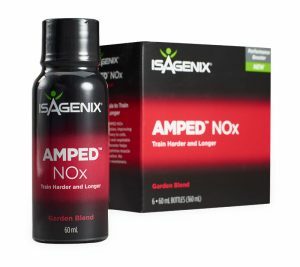 Isagenix AMPED NOx - Supercharge Your Workouts! For those in search of strength and stamina in a single powerful shot, Isagenix AMPED NOx is a vital pre-workout supplement designed to help you maximise results. Containing a potent and pleasant blend of fruit and vegetable extracts, AMPED NOx boosts performance, immune function, and overall health. When used alongside Isagenix AMPED Nitro prior to working out, you’ll have a complete supercharged combination of ingredients designed to keep you healthy, energised, and strong. Each box contains six 60ml bottles. 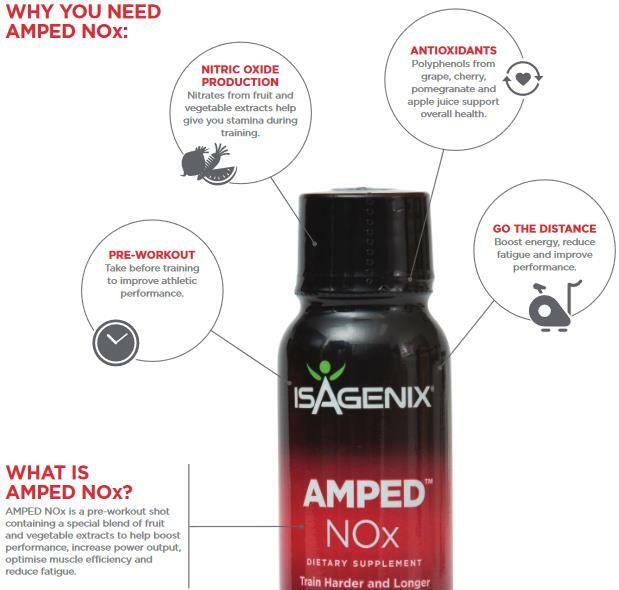 Isagenix AMPED NOx is a powerful pre-workout supplement shot that primes the muscles and provides you with the energy and stamina you need to not only endure grueling exercises, but perform at your max. The popular pre-workout shot contains a thoughtful and effective blend of vegetable and fruit extracts as well as polyphenols from apple, cherry, grape, and pomegranate juices. The result is a powerful blend that helps boost performance, optimise muscle efficiency, increase power output, reduce fatigue, and support overall health. NOx is best taken in conjunction with the rest of the AMPED range and Isagenix Eshots. Why Is AMPED NOx So Special? AMPED NOx provides a performance boost by utilising select fruit and vegetable nitrates to deliver nitric oxide to the blood vessels, which in turn supports blood and oxygen flow to the muscles. With your muscles primed and ready to perform harder and longer, there’s no limit to what you can achieve in the gym or on the court, track, or trail. Improve Athletic Performance – When taken pre-workout, Isagenix AMPED NOx will increase blood and oxygen flow to your muscles, allowing you to train harder for longer. Boost Your Nitric Oxide Production – The fruit and vegetable nitrate extracts used in AMPED Nox provide you with added stamina during training. Help Your Immune System – The polyphenols from the apple, cherry, grape, and pomegranate juices in NOx help support your immune system and overall health. Increase Your Stamina – AMPED NOx is proven to reduce fatigue, boost energy, and improve athletic performance. To see the full list of ingredients, down the PDF here. Like nearly all Isagenix products, AMPED NOx is dairy, soy, and gluten-free. Contact Nicole at info@isaelite.com.au or call her on 0413 254 398. Your query will be answered ASAP. How Can You Buy Isagenix AMPED NOx? Sign up with Autoship to take advantage of wholesale prices and fast delivery from the closest warehouse (Perth or Sydney for Australia orders, Auckland for NZ orders). Change your scheduled order or make additional orders whenever it suits you. You can cancel Autoship via email or phone at any time with no contracts or strings attached. Remember, if you are not completely satisfied with your products you can send it back for a full product refund. All products for your first order are covered by a 30 day money back guarantee. Full details can be found here.